The following fill in the blanks come from Brooklyn-based indie-rock band, A Deer A Horse. Recommended if you enjoy St. Vincent, Screaming Females or Savages, this project was brought together by Rebecca Satellite and Angela Philips. 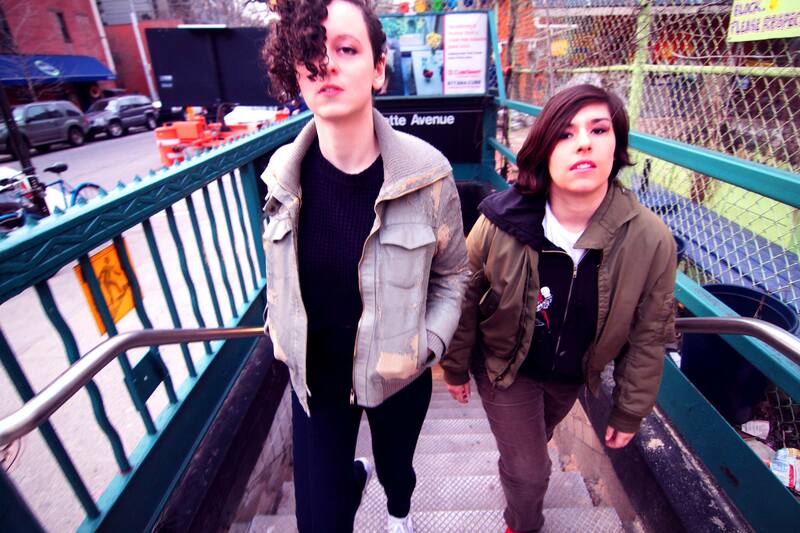 After attending Sarah Lawrence College, the two met up in New York and began collaborating and working on their 2013 EP, Patience. Learn more about the band and their music from their responses and be sure to check out the live studio recording of “Mother Night” below. Three words we’d use to describe us are….We had a whole list of words, pages and pages worth to describe us (they were mostly expletives). After a lot of really heated discussions and arguments that may have devolved into throwing plates of spaghetti at each other, we narrowed it down to four words that describe us, we are sorry we couldn’t get it down to three, but we really felt that these four were the most necessary in describing the unique and innovative experience that is listening to A Deer A Horse: urgent, stark, intense, fluffy. The story/meaning behind our name A Deer A Horse is….The name is in reference to the Chinese idiom “calling a deer a horse” which in turn is referencing an incident involving an advisor in the Qin Dynasty named Zhao Gao, who was by many accounts one of the most ruthless, corrupt politicians of Chinese History. Gao wanted to see which of the emperor’s advisors were loyal to him, so he brought a deer into the court and called it a horse. Some out of fear agreed that the deer was a horse, some remained silent while others dissented, saying Zhao Gao was crazy. Gao arranged for those who dissented to be executed, therefore ridding himself of anyone standing in his way. We found the story very interesting: first, because Zhao Gao chose something very innocuous to determine loyalty and instill fear, and second, because even in the face of such an evil person, some still chose to stand up openly against him, even if it meant certain death. The pickiest eater is….Dylan, he’s just very committed to his health, you know, it’s why he insists on drinking the most disgusting smelling and tasting protein shakes of all time, and then complains about how disgusting smelling and tasting the protein shakes are whilst drinking them. The man is just really committed to his health. For fun we like to….Eat our weight in chips while watching Dylan work out. We’re currently listening to….Vomitface, Slothrust, Protomartyr, Fugazi, X, Queens of the Stone Age, True Widow, Courtney Barnett. Our favorite songs of all time include…. We find inspiration from….Cats, sometimes humans, but mostly cats, specifically Rebecca’s cat named Kitty, very inspirational creature, she likes to shed her inspiration all over us constantly, we spend a lot of money on lint rollers. One thing we want you to remember while listening to our music is….Sometimes we like to stand as close to a mirror as possible while singing our songs and really breathe hard to see just how foggy we can get that mirror by the end of the song-important facts. The first song we wrote together was….In the beginnings of ADAH Rebecca brought in mostly finished songs, the first song we truly collaborated on, meaning we each wrote foundational parts and worked closely on the arrangement, was “Terrible Two” off of our first release Patience EP (2013). We’re absolutely terrified of….Definitely roaches factor pretty high on the things we’re terrified of scale, we know that they have the ecological purpose of decomposing stuff, but they scuttle and are creepy, unless they get their act together and stop creepin’ everyone out, you know become more self aware creatures about their level of creepiness, we’re sorry but we’re just gonna have to continue being terrified of them. Our last meals would be….Well, Rebecca’s last meal almost was a cheese quesadilla she was attempting to consume at a Hooters in Memphis TN and if Angela hadn’t been so distracted by the Batman movie that was playing on the TV over Rebecca’s shoulder, she may have assisted Rebecca in the Heimlich maneuver she had to give herself in order to not choke! Angela’s last meal will probably be the dirt on the ground that she accidentally consumes when her face hits it after falling off the stage during one of ADAH’s performances- Angela falls off stages a lot. Dylan will never have a last meal, because he’s a legend and he will never die. This entry was posted in Fill In The Blank, Interviews and tagged A Deer A Horse, A Deer A Horse music, A Deer A Horse NYC, alternative, band interview, brooklyn, fill in the blank interview, fill in the blanks, Indie, indie rock, interview, music, NY, NYC, Patience, Patience EP, rock. Bookmark the permalink.